A town is set to commemorate the centenary of its town hall being burned down a year after World War One. 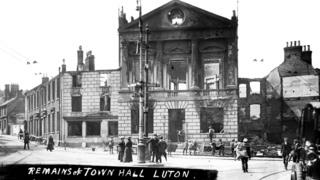 Luton Town Hall was attacked in July 1919 by people disillusioned with conditions after the Great War in what became known as the Peace Day riots. The town is using the centenary activities as part of a "pilot" year to see if it can formally bid to become the UK City of Culture in 2025. The borough council has set aside £350,000 for such events across 2019. A spokeswoman said they hope to submit a bid in 2020. The town hall was stormed and burned down by members of the public in July 1919 - who, it was reported, believed they had been excluded from the Bedfordshire town's Peace Day celebrations which were taking place inside. The Peace Day was a bank holiday declared across the country to celebrate the end of the 1914-18 conflict. This year's project, known as People Power Passion, will involve events across the town between June and October. The Labour-run council said it would "highlight the similarities and differences between past and present democracy". But leader of the Liberal Democrats, councillor David Franks, said he was concerned where the money was being spent. He said: "I just think it is one of those nice things to do when you've got everything else sorted, which they haven't." Debra Knight, one of the artists involved in the project, said: "The idea is bringing people together to celebrate their town, to understand their heritage and to understand the important things that have taken place. "Luton is always known as the underdog, and sometimes it is nice to see a different side. "I was born, made and raised in Luton, I am proud of my town, I want everyone to see if in the most positive light they can." Labour councillor Rachel Hopkins, portfolio holder responsible for arts at the council, said the pilot year was about giving people a "voice" and "letting us know as politicians what they think, so this is a really smart move about investing in our town and in our future".